Barry Levinson | WHAT A FEELING! At a half-dozen or so moments, Rain Man comes within hailing distance of being a great film. It fails, but it is still the most intriguing big-studio movie being released this Christmas. The film only got made because of the persistence of the two stars, Dustin Hoffman and Tom Cruise. A bunch of big-name directors were involved with the script from time to time, including Steven Spielberg, but the movie had trouble getting made. And after months of delays, the writers’ strike nearly put the script out of business permanently. It’s easy to understand why the two actors felt so strongly about the story. At its heart, Rain Man has a wonderful idea. Cruise plays Charlie Babbitt, a slick Los Angeles wheeler-dealer whose latest scam is unloading Italian cars. When he hears that his father has died in Cincinnati, it isn’t much of blow; he hadn’t spoken with the old man in years. But it is a blow when he learns that the father’s $3 million estate has been inherited by someone else, an older brother, Raymond (Hoffman), whose existence was unknown to Charlie. Raymond is autistic, and has lived in an institution for many years. Charlie quickly gets Raymond out and hustles him back to L.A., the better to get his share of the money. It is a fascinating story, and the film unfolds, somewhat messily, as a road movie (Raymond refuses to fly) as the brothers travel west in their father’s Buick Roadmaster. It turns out that Raymond is an autistic savant, unable to function in the world, his life organized around rituals (Orange Crush at every meal, watching “The People’s Court” every day at the same time), but with a genius for numbers. His memory is so exact that a trip to the blackjack tables in Vegas produces a tidy return. Barry Levinson (Diner and Tin Men) is the director, and he creates some beautiful sequences, such as Raymond’s turn at the wheel of the car in a casino driveway, or his “date” with Charlie’s Italian girlfriend (Valeria Golino), which consists of a kiss Raymond describes as “wet.” Unfortunately, Levinson puts the “rain man” material, which relates to the brothers’ childhood, on the back burner. It seems more important than that. 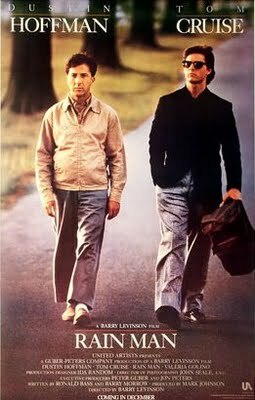 Oddly enough, I think Rain Man falters because of the two lead actors. Hoffman gives a precise, technically brilliant performance, but I always had the feeling I was watching Dustin Hoffman give a brilliant performance, instead of just watching Raymond. Cruise, who tries manfully, is a bit out of his depth here. It’s tantalizing to imagine someone like James Woods in a role like this. Both men seem to improve as the movie goes along, and the film’s flaws largely recede. This is simply one of those movies that, from its opening minutes, let you know that something special is going on. There are precious few of those around, so Rain Man qualifies as recommended viewing. The movie went onto the list of Squaresville Oscar winners when it got best picture that year, and my reservations are intact, but it is cinematically defensible, I think. At least it deserves better than to be lumped in with the Out of Africas of the world. “The game is afoot!” cries the greatest detective who ever graced the pages of imagination. However, the face from which the phrase emanates has not yet felt the touch of a razor, and the speaker is too young to have smoked the famous pipe. That’s because this is Young Sherlock Holmes, the story of the sleuth’s crucial boyhood adventure. If the title has the suggestion of spoofiness to it—a la Mel Brooks’s Young Frankenstein—don’t worry. This is a straight version of the boyhood days of Holmes, without any cute jokes at the character’s expense. 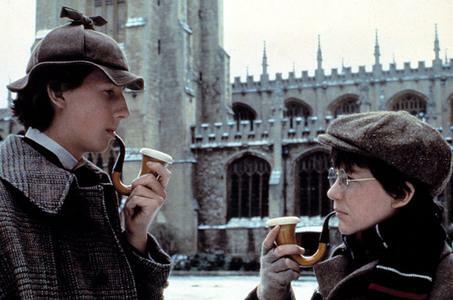 Naturally, there could be no Holmes without Watson, and as the film begins, an adolescent John Watson is making his way into a new boys’ school. As he enters the dormitory, he hears the anguished sounds of a violin being tortured. They player is a lean youth who expresses his fury at not having mastered the instrument. “How long have you been playing?” Watson asks. “Three days,” replies the analytical stranger, who could be no one but Sherlock Holmes himself. A friendship develops, which must sustain the two through a harrowing adventure to come: the strange case of some angry Egyptians, who have built their own pyramid in a seedy section of London and plan to kill a batch of Britishers, using a hallucinogenic drug shot through a blowpipe. The film moves from the scenes at the boys’ school, where Holmes first displays his deductive powers and from which he is wrongly expelled, to this wild adventure, as our heroes force a showdown at the ornate pyramid temple full of chanting Egyptians (the film is lavishly mounted). This lively plot is an invention of scriptwriter Chris Columbus, who also wrote Gremlins and The Goonies, which were produced, like this film, by Steven Spielberg’s company. It owes nothing to Arthur Conan Doyle, in terms of plot, but it does take pains to be true to the spirit of Doyle’s detective. Much credit should also go to director Barry Levinson (Diner). Columbus’s script is a bit heavy on laborious exposition, and the film gets off to a meandering start, but Levinson’s affection for the characters carries the day. He’s chosen three wonderful actors—none of them star faces—for his principals. Nicholas Rowe is a dead ringer for what you imagine the young Holmes must have looked like. Even his long, worried stride is appropriate for the character. At Watson, Alan Cox, a squat, bespectacled boy, gets most of the laughs in the film, as well he should. He effortlessly communicates the mix of exasperation and hero worship that the young Watson would have for Holmes. Sophie Ward, a radiant young actress, plays the young lass who is the love of Holmes’ life. And Anthony Higgins is memorable as Holmes’ demanding school mentor. One thing: Don’t leave during the end credits. There’s a tasty little surprise tacked on after the credits, which should please fans of the detective, and suggests that, though the film may be over, the game is still very much afoot. It doesn’t seem to be especially remembered today except as a culty item for the Goonies generation. At the time, I thought it created a rather nice Sherlockian glow, but I’m worried about actually seeing it again. The table is so full of starpower it fairly trembles. There sits America’s star, Robert Redford, looking superb in a film that shrouds his character within the cloak of the Great American Myth; a cloak that inevitably surrounds the actor himself. Across from Redford is Robert Duvall, the actor’s actor who is riding a crest of respect (including the Oscar, of course) and a surge of activity. It is well within Duvall’s powers to command any scene in which he appears, especially with a juicy role like sportswriter Max Mercy, but his performance in The Natural is typically considerate of his fellow actors. Between the two heavyweights sits Kim Basinger, a hot starlet who shot from being a James Bond girl (Never Say Never Again) to being the funniest thing in a Blake Edwards movie (The Man Who Loved Women) to this key role in the company of legends and near-legends. They’re sitting at this table in a posh nightclub, where Duvall has brought Redford to meet the local gambling kingpin. This is the fourth person at the table. It’s Darren McGavin. Now, here’s a guy, a journeyman actor, been in movies off and on for years—actually, done mostly TV for the last decade or more. And it’s an interesting thing, because he’s got to sit amidst the cream of the Hollywood crop, and he’s got to run the scene. Actually, the Redford character controls the scene, in a subtle way, but McGavin’s character has to orchestrate it. Not only that, but McGavin is playing a bigshot, an important man surrounded by underlings—in the exact opposite of his real-life position vis-à-vis the other actors at the table. I’m thinking about this scene, and about McGavin’s good performance in general, because it’s one of the few things in The Natural that strikes me as being truly intriguing, or weird, or out-of-place. The film is a series of perfect dream images, the effect of which becomes sort of numbing after a while. At first, the interlocking elements of the plot promise something majestic: a boy’s father succumbs under a tree in the backyard; lighting hits the tree; the boy carves a baseball bat out of the cleaved wood, a bat with a lightning bolt carved on it. The stuff of myths and legends (as Barbara Hershey points out to us, in case we hadn’t noticed); and the sunset scene in which the boy, now grown and on his way to a big-league tryout, whiffs a baseball legend named the Whammer (played with Ruthian magnitude by Joe Don Baker), is a wonderful slice of history-in-the-making. 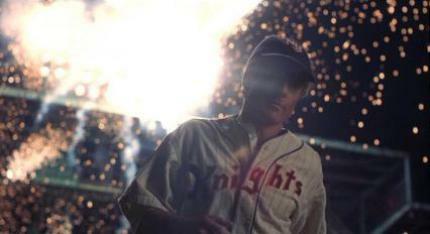 (Is there any doubt the little boy to whom Redford’s Roy Hobbs gives the strikeout ball is the same Nebraska farmboy who steps up to face Hobbs for the last out of the last game of the pennant race sixteen years later?) And I, for one, will always cherish Hobbs’ first at-bat, when he takes his manager’s idle bit of baseball chatter—”Awright Hobbs, tear the cover off the ball”—quite literally. But the movie starts to have a clockwork feel to it. And there’s very little genuine baseball funkiness here; the closest it gets to that kind of thing is the scene in which the manager (Wilford Brimley) and the coach (Richard Farnsworth) play a laid-back game of “Name That Tune” in the dugout. You would guess that Barry (Diner) Levinson would be a perfect choice to make a baseball movie, but The Natural exists in a carefully-composed ozone layer where the sweat and dirt and grease of Diner are not allowed. Clearly, this is what the filmmakers wanted, and there are many beautifully-realized bits of action (like the business with Brimley and the dugout water fountain). But you wonder if the film might have been more satisfying if it wasn’t trying so hard to be a Great Film. It’s tempting to envision Levinson as a slave to the awesome talents of cinematographer Caleb Deschanel, whose film this seems to be as much of Levinson’s. But remember that the movie was initiated by the producers, who also wrote the screenplay and cooked up the alterations of Bernard Malamud’s novel. And there is the possible influence of Redford, whose Ordinary People featured similarly fastidious production design. The submersion of directorial personality in The Natural, due (perhaps) to the collaboration of many very talented people, is reminiscent of a couple of other big films this year that hark back to the “Tradition of Quality” school of filmmaking. I like Greystoke and The Bounty as well as The Natural, and was variously enchanted and riveted by all of them, but had a similar feeling as the lights came up after each: Is that all? Somehow the emphasis on story and production value seemed to eclipse the men who made the movies. Official classics have a tendency to become—well, official, and the lifeblood can drain out of them quickly. A number of people who have seen The Natural have pointed out the irony of its title. For all of its loveliness, grace, and good intentions, it’s just not natural. As the late great “Voice of the Mariners” Dave Niehaus used to say, it’s corn-growin’ weather, so the warmth of early September seemed like a good time to print a baseball review. 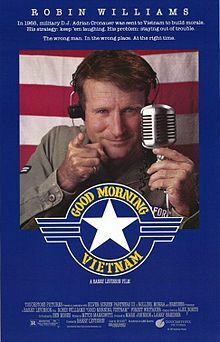 I watched this movie two nights in a row, for a variety of quirky reasons that we need not go into now (but one of them involved the opening night of the Seattle International Film Festival that year). As a person who loves baseball and the Malamud novel, I want it to be a great movie, but I can’t get past the over-dressed myth-making or the serious selling-out of Malamud’s final act. There’s still quite a bit to love, don’t get me wrong, including the locked, ominous close-up of Barbara Hershey as she shifts her gaze from west to east, her focus changing from established star to newcomer as Hobbs strikes out the Whammer by the railroad tracks on a late afternoon. The thing that amazes me is that I didn’t mention Randy Newman’s score in this review, a modern classic later re-purposed to exultant end in Chuck Workman’s montage Precious Images.